Once again I have some surplus DVDs that readers may like to have for nothing, or at least, only the cost of postage. These are mostly DVDs that have been sent to me for review purposes. Note: These DVDs should not be sold. Most are marked as review copies. None have DVD cases, and most don't even have slicks (the paper inserts), although it is indicated for those few that do. Except where marked, they are in PAL format. Some I am giving away because they are duplicates, others because they have no interest for me or anyone in my family. UPDATE (Thursday, 25 August 2005, 3:44 pm): As the titles above were and are claimed, I have struck and shall strike them out. 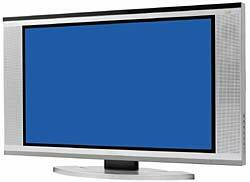 I've just received a press release from NEC Australia saying that the selling price of its 40 inch (100cm) widescreen LCD TV, the NLT-40W, has been reduced from $9,999 to $5,499 (as I write, the NEC Web site lists the price as $6,999). That's an extraordinary price reduction and marks the LCD actually becoming competitive to the plasma (admittedly, the competing plasma displays are a couple of inches larger. The main problem with LCD TVs is their poor contrast ratio. This one is specified at 600:1. That makes them not very good for darkened-room watching. On the other hand, you can sit much closer to one than to a plasma while retaining a very smooth picture, because the interpixel boundaries are much, much thinner. So for regular, lit-room, family use they're excellent. The NLT-40W, incidentally, is a high resolution unit with 1,280 by 768 pixels, has a DVI input and built in stereo speakers. The eye/brain mechanism for seeing is remarkable. We rely intensely on its 'defects' for home theatre. Consider a projector. It is casting an image onto a white screen. Yet with a good projector in a dark room, the black areas of the projected image look black. Clearly they must be white, because the 'black' is simply an area on the screen where no light is being projected. Or not much. If you are using a digital projector (LCD, DLP or LCoS), if the scene fades out to black and you pause the picture, after a few seconds you'll see that it's not black at all, but a dark grey. That's because no digital projector can yet full eliminate some light leakage. Yet even a small bright part appearing on the image can make the rest of the screen look dark, midnight black. That's because our visual circuits have a light intensity averaging system built in. The point of vision in the human animal is to facilitate recognition, not to act as a scientific instrument delivering lux counts. Our averaging system allows a black cat to look black even in bright sunlight, even though it is considerably brighter than a grey cat seen under modest artificial lighting. It is this averaging system that allows projectors to produce subjectively good images in our home theatres. This post over at the 'WILLisms' blog demonstrates the point clearly. Two squares are identical in grey level, yet one looks dark grey while the other looks almost white. Go and have a look. It is quite startling. Back before I started writing for a living, I wrote letters to newspaper and magazines of the whinging, complaining kind one still sees. For those interested, I've posted the ones that were published here. Starship Troopers (original and Special Edition) versions.